The Vampire Facial® is the most popular non-surgical aesthetic procedure used by today’s hottest Hollywood celebrities. Its popularity has increasingly become mainstream because it is both affordable and completely natural. In a single visit, the procedure accomplishes more than a typical chemical peel or laser treatment. The Vampire Facial® takes advantage of the proven effectiveness of Platelet-Rich Plasma (PRP) to stimulate NEW skin cells, collagen, elastin, and hyaluronic acid to create youthful beauty! Consider this — Our skin is grows from the inside out! We make NEW collagen, elastin and hyaluronic acid underneath the dead skin cells that we see on the surface. Collagen makes our skin firm. Elastin makes our skin elastic and bouncy. Hyaluronic acid makes our skin silky smooth. So why does every treatment seem to focus on the outer surface of our skin? Creams, chemical peels and laser treatments only treat the dead skin cells on the outer surface. Wouldn’t it be great to find a treatment that would cause your skin to regenerate rapidly from the inside out? This is what we are accomplishing with the Vampire Facial O. By making small punctures in the skin we can allow the Platelet-Rich Plasma (PRP) to pass through the skin, reaching the down to the dermis where skin actually begins to grow! Because PRP contains growth hormones and stems cells that cause an inflammatory response, healing of the skin is initiated from the bottom to the surface. Is the Vampire Facial® right for me? Your blood is drawn in the office and then put through a centrifugal system for 16 minutes to separate the platelets and from the red blood cells. While this happens, we apply anesthetic cream to your face to minimize discomfort during the procedure. The Platelet-Rich Plasma (PRP) is then micro-needled into the skin. To do this the MDPen® is gently glided over the skin to create tiny punctures, thus introducing the PRP to the deep dermis. In terms of pain, the procedure is only mildly uncomfortable and takes only a few minutes. Once it’s done, you’ll have a small bit of swelling but that tends to go down within an hour and will be completely gone within the same day. You will begin to see results within 2 weeks, but the Platelet-Rich Plasma continues to remodel the skin for up to 3 months. Therefore, you will see continual improvement for about 3 months! We will ask you to recheck. In 2 months to take an after photo for comparison. We can discuss any further needs at that time. You can expect that the effects of the treatment will last for 24 months or longer! The recovery time after a Vampire Facial® is about 24 hours. There will be temporary redness of the face which will fade over the next 24 hours. You may apply mineral makeup the next day and continue your normal routine. 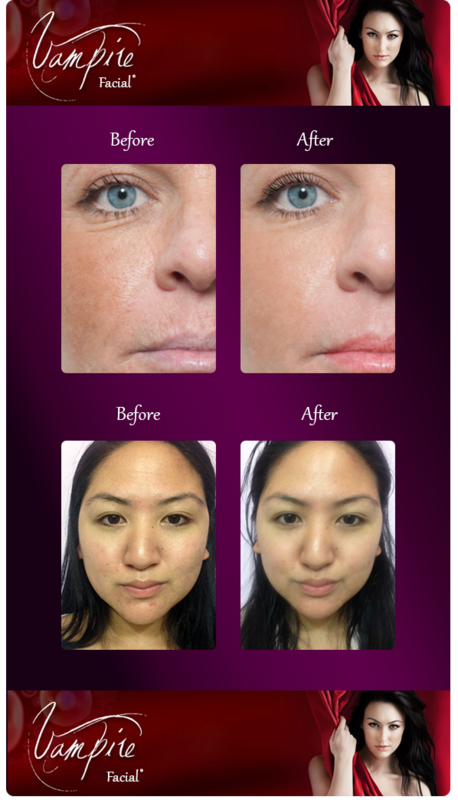 Who can perform the Vampire Facial®? The Vampire Facial®, like the Vampire Facelift®, is a trademarked procedure created by Dr. Charles Runels. He trained Dr. Newsome in how to use his techniques to perform these particular procedures. It is a way to standardize cosmetic procedures so that people from Florida to New York can ask for a certain procedure and know they are getting the same treatment.